The main reason I came to Malapascua Island was to dive with the Thresher Shark. The island is the only place in the world where Thresher Sharks can be seen pretty much any day. I really enjoy diving with sharks. It’s quite a thrill to see these scary looking predators swim towards you, turning away only after coming almost within a few meters. For some reason I’m not scared of sharks. I get so excited when I see one that I forget that they could kill me if they wanted to. Near Malapascua is a sunken island called Monad Shoal. 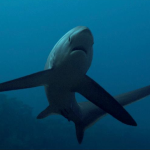 The Thresher Sharks gather here early in the morning at a number of so-called ‘cleaning stations.’ The small fish that reside here eat the dead skin, parasites and bacteria from the shark’s body. The sharks prefer to be in the deeper, dark waters so when it gets too light they leave. The best time to see them is around 4.30 – 6am. During my first dive I was unlucky and didn’t see any. The next day I got up at 4.30am to give it another go. After entering the water, we went down to the top of the sunken island at 15 meters deep. From the edge we could see the cleaning stations that lie at 25 – 30 meters deep. Since you can’t dive that deep for the full duration of the dive, it’s best to scan for the sharks first and go down when you spot one. 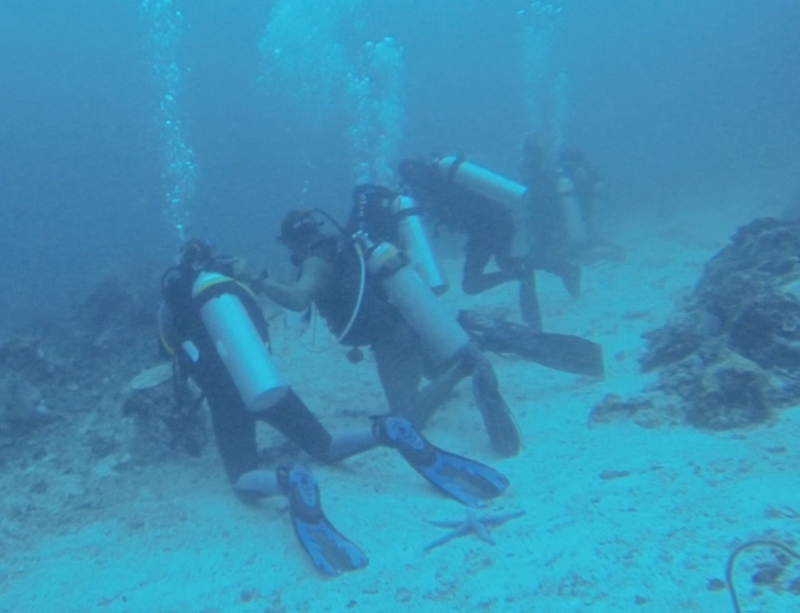 At first we didn’t see any, so after a while we descended to the edge of one of the cleaning stations. To not scare away the sharks, a rope has been put up to mark the edge of the area where the sharks gather. It’s best to quietly sit down on the sandy bottom and wait for them to show up. I was very really happy to see this majestic creature swim so close-by! It swam in circles for a couple of minutes, making three rounds after which it disappeared into the darkness. Mission succeeded! This underwater statue you have just looked at is a Frogfish. Certainly a strange looking creature that is very hard to spot if you don’t know what you’re looking for. Frogfish are masters in mimicking. This one tried to look like a piece of coral and it did a pretty good job! It was waiting for it’s lunch to swim by. We also ended up seeing a Orang Utan crab, an Octopus and a juvenile Moray eel. All-in-all a very successful dive! A special thanks goes out to the guys at Sea Explorers who really didn’t a great job making this possible. Seems like a lot of fun! Glad u enjoy the philippines sea creatures. Thanks! That Thresher shark was definitely the highlight! I be you had a awsome day seeing those intresting creatures.